An inexplicable addition to the American Film Institute’s Top 100 list in 2007, Swing Time is a mystifyingly stupid movie. If you’re compelled to see a Fred Astaire/Ginger Rogers musical, go watch Top Hat. Watch it twice. Then rent it. Buy the DVD. You should do all that before you endure the movie that’s a terrible representation of George Stevens’ talents. I mean, this is the guy who directed Shane! At least the dancing scenes are beautiful choreographed and performed by Astaire & Rogers. You can find those on YouTube though. 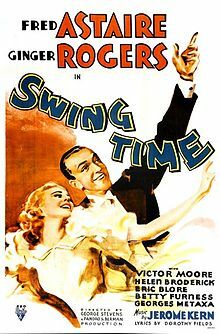 If you spend 103 minutes with Swing Time, you’re going to have to figure out how gullible Lucky Garnett (Astaire) is that he lets his stage “friends” distract him from his wedding. You’ll get to “enjoy” Astaire doing a racist number in blackface. You’ll be “treated” to a woefully horrible performance by a dopey Victor Moore. You’ll also have to go through an entire movie’s worth of “will they or won’t they” with your “I don’t care if they” goggles on. Many (most?) rom-coms put up roadblocks to 2 lovers from becoming lovers, but they’ve got to create a story worth suspending that disbelief. This movie doesn’t make that work very well, although what’s worse is how Astaire and Rogers’ intendeds handle their respective break-ups. They take it waaaaay better than a real human being ever would. In short, this movie is no good.